Yay your back blogging, I only just noticed (sorry) hope all is well with you ? Greetings Lynn, well this is certainly an adorable design. Nice use of the string and super cute penguin. Hello Lynn...awww..love your cute penguin with his love letter...gorgeous CAS card.. This Valentine card is adorable Lynn! I love that penguin and the fab clean design! Hi Lynn, hope you and Jim are well. A cute little Valentines card, not even started mine yet! I do love penguins and the twine is wonderful addition to the card. That sweet penguin is one cute critter, indeed, Lynn! What a fun Valentine!! 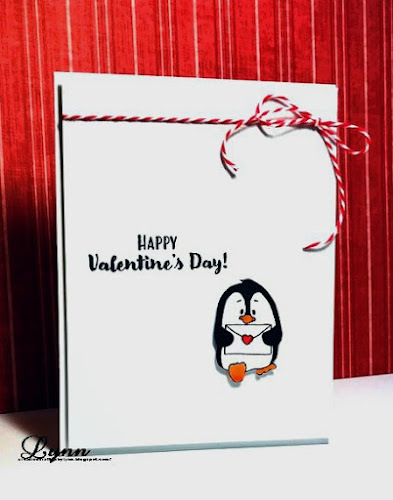 I think a little penguin holding an envelope with a red heart is perfect for Valentine's day, and the more CAS, the better! This is totally cute and perfect for the occasion :) Wishing you a good week ahead! CAS and fantastic!! I love how the color of the red heart just pops! I've been making quite a few git 'er done cards myself! Not enough hours in the day!! Good to see you here again Lynn - and I love your card - it's a real cutie, fast to make or not! This is adorable, Lynn! Get 'Er Done are my favorite kinds of cards! Hey, hey! I am only a day late with this comment! How can you not smile when you see a penguin... especially one holding a Valentine note! Adorable! LOL I adore this penguin and mostly I adore your git 'er done style, Lynn. You always do it so that it looks classic, never rushed. :-D Obviously, I'm tickled pink to see you playing along with us at 2 Crafty Critter Crazies. Thanks. Hello, Lynn! This is sooooo cute! I love penguins, and your CAS design is beautiful! Just popping in to thank you for the warm welcome back to my blog! I am doing things differently now and won't be able to visit much but wanted to say hello! Enjoy your evening! Lynn, Imagine how tickled I was when your name came up on the Random.org as the 2CCC winner for January! Send us an email to claim the prize when you can.